Over the past twenty years, not too many things have changed in June Lake. Main stays like Ernie’s & the Tiger Bar have been around since the 30’s. So, it came as a shock when we made the journey down to shred June Mountain this season that something big is happening. An energy that wasn’t there when we visited almost five years ago was alive & electric. Walking down main street, a plethora of new places to eat, drink, and hang out have opened. It’s a new era on the June Lake Loop that you need to experience. What has caused this spark for new businesses to open? To answer this question, you must look at the tourism behind it. Mountain towns are at their soul’s cyclical. People descend upon cozy hamlets in a short, albeit enjoyable season. For most, this peak period is winter, but for June Lake Loop, it’s actually summer. The goal for most is to catch the “big fish” on one of the many alpine lakes surrounding it. When Alterra decided to re-open June Mountain, it didn’t just mean more ski terrain, but rather kicked off the spark that helped usher a new era for the June Lake Loop. And what was the first new business to open in June Lake after the resort re-opened? A brewery of course! June Lake Brewing is located a block off the main drag & is a destination in and of itself. June Lake’s quality of water is the stuff of legends. Since beer is 90-95% water, combine that with a mad scientist of creating ales & you better expect some of the tastiest beers you’ve EVER had. And to top things off, served alongside the great selection of award-winning ales is the Ohanas 395 food truck. You can order up a delicious “Hawaiian soul food” dish & they’ll drop it off right in the tasting room. As you pull into town, one of the first structures you come up to is “The Lift.” It’s pretty obvious since outside of it is an old school chair-lift hanging in the sky. The interior is what you could call mountain modern. Concrete finished floors, a wine bar made out of 200-year-old Monterey cypress and bright lighting makes it feel hip but at the same time comfortable. A place you could see yourself studying or just hanging out for a glass of wine. While most cafés talk a big game about making high quality, fresh food and awesome customer service, the Lift actually does it. No matter if you show up for breakfast, lunch, OR dinner, the artistic variations of cuisine are something you’d expect in Los Angeles or New York not June Lake. For example, their popular California croque monsieur sandwich is like a Reuben meets a French dip. The bread is the key! It’s crunchy on the outside yet soft on the inside. AMAZING! And no matter what… if there’s a special, TRY IT! You won’t be disappointed. After a big day on the mountain or fishing on a pristine alpine lake on the Loop, you can build up quite a big appetite. Gordo’s Mexican restaurant will make sure you walk out happy & full. For starters, you get complimentary homemade chips and salsa. Instead of the typical watery variety, their salsa is as thick as a pasta sauce & perfect for dipping their fresh homemade tortilla chips. Nearly everything on the menu is delicious, well-crafted, and big. In fact, the portions are so large that you could split them between two people. You wouldn’t guess in a town of only 600 residents there would be a good music venue. Well, in June Lake you’d be wrong! This hidden gem is just one stage of a multi-year project to bring back the Sierra Inn to its former glory. They are making sure to respect the feel of the region but at the same time improving upon it with such things as bringing in a world-class sound system. The T-Bar Social Club is a perfect place to rock out to live music, see live comedy, hear inspirational speakers, and so much more. If you take a moment and walk down Main Street, you’ll see many other businesses that have decided to open up shop. While we ended up riding until last chair every day, we heard great things about Hermitage Juice Bar. This quaint café dishes out clean & healthy food, well-crafted coffee drinks, and of course cold-press smoothies that will make your body run at peak performance. And it’s not just food and brews that are opening either. If you’re looking for a cool souvenir, be sure to check out Gallery 158. Named after the Loop’s designated highway number, you might find the perfect souvenir to bring home. And for those that enjoy an alternative way to relax, consider swinging by High Sierra Cannabis. They’ve collaborated with a flower (the term of art for “bud”) producer to create three unique-to-June strands: June Bloom, Bodie Ghost and Gnome Zone. And last but not least, a new tech startup by the name of Insane Audio is in town which builds premium off-roading sound systems. Old Stomping Grounds Are Still Here Too! Does that mean all the ole’ stomping grounds are gone? Nope! Ernie’s is still here making sure that your fishing or ski gear is ready for the day. The Tiger Bar & Café still holds the second OLDEST liquor license in California serving up mean drinks to the wee hours of the morning or a Patty Melt made out of fresh never frozen beef. 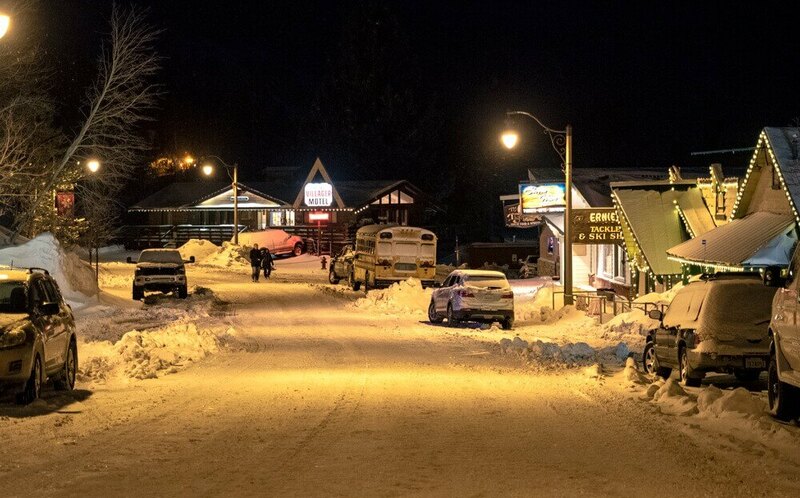 You may come to June Lake for the impressive scenery, easy access to backcountry skiing, and crystal-clear waters, but now you’ll want to stay for all the fun you can have AFTER the sun goes down.